New Casinos can be very appealing to both long-time gamblers and first-time players. This because they often have features like unique lobby layouts, better bonuses, and fun new games. New online casinos appear very frequently, just as many casinos fade in and out of popularity. In fact, since the beginning of 2016, there are at least 30 new casinos available, and new casinos appear on the scene nearly every day. 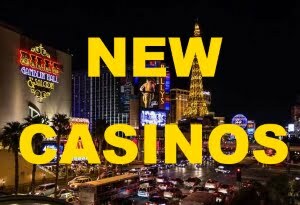 Bellow you can find the latest 12 additions of new casinos listed on this page to rate and review. New online casinos could be completely new, or they could be developed by a company that has been in the gaming industry for years. For example, some online casinos are sponsored or owned by the same company, but they have different themes or game variation. They will occasionally belong to the same network of online casinos as well. New casinos often use the same software providers, like Microgaming and Net Entertainment, but it is possible that newer casinos design and create their own online game as well, but this is relatively rare. Some new casinos are new because they have been transferred to a mobile format. As the use of smartphones and other mobile devices increase, users will begin to see online casinos that are mobile-device focused or have the ability to be paid on a mobile device (even where the casino is not brand new). What is a New Casino? New Casinos are those that have just been licensed and put online for available use. They vary a great deal in both the games that they offer and their theme. Some are specifically tailored to citizens of a certain country while others try to broaden their customers to include most of the world. Some countries are usually excluded from using these online casinos, so users will have to check to be sure the new casino does not violate any of the laws of their home country before they begin playing. Perhaps the best thing about new casinos is that they usually have great welcome bonuses because they are trying to attract new customers, and they have to compete with existing, and better known, online casinos. Often, these bonuses are offered without the need to even submit a deposit. The new casino just wants to get players in to try their casino, so giving away free spins and no deposit bonuses are fairly common. Getting on the ground level at a new casino may also help the player get into (and use) their VIP program quickly as well, depending on the casino. The only real downside to new online casinos is that there is a possibility that they will not last long in their new market. But, if the player is one of the first to use the casino, it is difficult to tell which online casinos will last and which ones won’t be around next week. Usually, however, if the online casino takes a player’s deposit and then shuts down, the online casino should refund the player’s deposit. That can occasionally be a difficult process. Some players take the added precaution of using a different payment method (other than their bank account or credit or debit card) for the first few times that they deposit at any new casino. New online casinos are used just like other online casinos. They may offer new or unique games and themes, but the gameplay and set up is usually pretty similar. Players will deposit their funds with the cashier, and they will play the different types of games that they prefer. Some new casinos offer new technology to play in live dealer “rooms” or to do virtual horse racing. Different formats like no download or mobile applications may also be available. Most players will go to new online casinos for the bonuses. Players should create an account at the online casino, and sometimes the new casino will provide a no deposit bonus. Other times the bonus may not be available until after the player makes their first deposit.